Term 3- Jaws and Claws! In term 3 we will continue our learning journey as we dive into the terrifying topic of 'Jaws and Claws'. We will be learning about dinosaurs and how they used to live and where. We will then be locating these different places onto a map. We will also look at fossils and how they are made. We will be enjoying stories such as ‘Katie and the Dinosaurs’ to get the children’s imaginations going. Our first day back at school in the New Year was fantastic! We had a super fun packed dinosaur day. We moved to the different year 1 classes during the day and carried out lots of different activities. In Class 5 we created repeating patterns of dinosaur footprints/claws using a printing technique (potato printing). In Class 6 we made split pin dinosaurs using various joining materials. We used split pins, glue and tape. In Class 7 we went fossil hunting. We also learnt about different dinosaur diets and discussed whether a dinosaur was a carnivore, herbivore or an omnivore. Finally in Class 8 we went exploring for dinosaur parts using clues that were hidden for us. While finding different clues we also found different body parts that belonged to a dinosaur. We also found out different facts about the dinosaur too! We found a bag with plants in, a bag of weights and a metre stick. The bag of weights had a post it note inside telling us how heavy the dinosaur was and the metre stick had a post it note attached telling us how tall and long the dinosaur was. We then had to use fact cards to work out the name of the dinosaur. We found out that it was a Brachiosaurus. We then drew a picture of the dinosaur using sketching pencils. Today (our second day back at school) was amazing! We’ve had a super time being ‘Dinosaur Explorers’. We had to hunt for fossils and use our paint brushes to dust off sand to reveal the hidden fossils. We have learnt lots of different facts about different dinosaurs and what they like to eat. We have looked at fossils of dinosaurs who were Carnivores and dinosaurs who were Herbivores. We got to meet two baby dinosaurs as well today. One baby dinosaur called Jack who was 5 years old and one baby T-Rex called Sophie who is 7 years old. Sophie was huge! We got to stroke both Jack and Sophie. Take a look at our pictures to see how excited we were. This term Year 1 have been learning more about Subtraction. We have remembered that the answer is a smaller number than our starting number, and that we have to jump to the left when we use our number lines because the numbers get smaller! We have tried some challenging word problems and even had a go at a tricky dinosaur code breaker! We had to work out some subtraction problems, and work out the missing letters using the answers we found out. We discovered the secret word was "fossil" but had to make sure our answers were right so we could spell it properly! We loved searching for the problems to solve and finding out which letters were missing. In English we have learnt about fiction and non-fiction books. First we had a selection of books and in our Disney teams we needed to sort the books into fiction and non-fiction. Next we came to the carpet and looked at the different features of fiction and non-fiction books. After we went back to our tables and checked our piles to see if we still agreed with the way we sorted the books. Some groups made some changes. Then we had a big grid where we had to sort out pictures of books and statements with features of fiction and non-fiction books. We worked together as a team to decide where they had to go. We know that a fiction book is a story book with a beginning, middle and end and we also know that they have characters and different settings. We also learnt that they have an author and an illustrator. We learnt that a non-fiction book tells you facts, has a contents page, glossary and index. We also learnt that non-fiction books have diagrams and labels in them too. So far this term we have been learning how to solve maths problems in our outside area and we are beginning to look at categorizing animals into families such as birds , reptiles, mammals and looking at where they live and what they eat. We are learning that herbivores eat plants, carnivores eat meat and omnivores eat both plants and meat. Class 5 have been learning all about timelines and the periods of time that dinosaurs lived in. We found out about the Triassic, Jurassic and Cretaceous periods and some of the dinosaurs that lived during these times! Our favourite was the Jurassic because this had lots of the biggest dinosaurs. We drew some of the reptiles we found out about and placed them on our own timelines. In Maths we have been learning about Multiplication. We have been learning about Repeated Addition and how this helps us to understand Multiplication. We have also been learning about Arrays. We used some real life Arrays to help us work out a multiplication number sentence and the answer. We used lots of different real life Arrays like egg boxes, chocolate moulds and Lego. We also made our own Arrays using cubes. See how many different real life Arrays you can find at home. For Creative Week year 1 are focusing on the Rio de Janeiro Carnival in Brazil. We will be learning how to play the Samba drums and how to dance. Class 8 have had a super start to Creative week as we have made some instruments to play in our band. We have made drums, guitars, shakers, scrapers and Pan flutes. We’ve had a super time at our Samba workshop. We had the opportunity to play on lots of different instruments. We loved saying the different words to help us stay with the beat. We loved decorating our carnival masks. We used lots of different gems, sparkles and we also used feathers. We’ve loved learning about Brazil for our Creative week. We were set a challenge to answer five different questions about Brazil. We had to skim read some information to find the answers. See if you can find the answers out to our questions too. We’ve loved learning about the Brazilian flag and what each colour means. We’ve also enjoyed making our own flag and decorating a gold or silver key ready to crown our ‘Fat Kings’, which we have made from clay, as this is how they start the carnival in Rio. Class 8 have been learning a special carnival dance. We have used some of the moves which have been inspired by the film Rio 2. We needed to learn 7 different dance moves. These were: Move 1- Miss Jewel, Move 2- Bongo Magic, Move 3-I spy, Move 4- Samba, Move 5- Blu’s Groove, Move 6- Hide and Seek, Move 7- Funky Monkey. Take a look at our amazing dancing. Class 5 have had a brilliant time during Creative Week! We did lots of fun activities, all based around Rio Carnival. We found out that Rio Carnival is in Brazil, that people there wear beautiful masks and do fun dances. We learnt that the main music and dance is the Samba. We learnt to play samba beats on lots of different drums and we tried to learn a samba dance step! We also got to use lots of art skills to make masks, birds (that live in the Amazon Rainforest), keys to give to King Momo and Brazilian flags. We would like to say thank you to all the special guests that came in to show us their talents! We had great fun learning about drums, guitars and pianos. Class 7 have been learning about odd and even numbers and using sorting hoops to help us, if there is one left over it is odd if they all go into the hoops it is an even number. 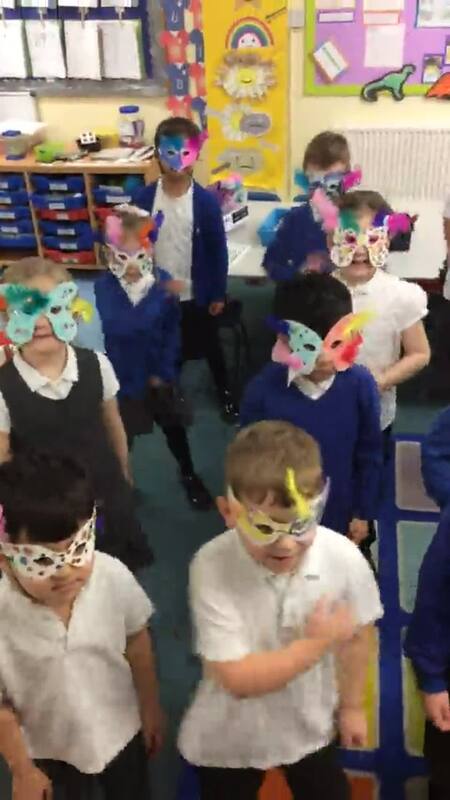 This week has been Creative week and we have been learning about the Rio Carnival making masks and learning about the music. We all had fun during our Samba workshop and all learnt how to drum using the Samba rhythms. We’ve had an amazing Art lesson learning some new skills. We have learnt how to marble using two different methods. We have used water and marbling ink and then shaving foam and paint. We had to mix the ink/paint to make a swirly pattern and then we placed our paper over the top to create the pattern. We loved using the shaving foam and enjoyed getting very messy! We discussed patterns, shape and design and compared our art pieces with our friends. We noticed that although we all followed the same method, all of our art pieces were different and unique. In Maths we are learning to partition. This means we are learning to break numbers into tens and ones. We have been using the Dienes to help us partition numbers, for example 44 is 4 lots of 10 (40) and 4 ones. We would write this in a number sentence as 40 + 4 = 44. Class 5 have loved learning all about dinosaurs this term. Some of us created some amazing dinosaur worlds for our homework! We got to apply lots of our skills learned in art, such as drawing, cutting and printing. Thank you to our grown ups for helping us, we have loved exploring new worlds every week! Class 5 had a great time searching for rhyming words in our outside area. We were challenged with some trickier words that had the same sounds, but different ways of making the sound such as "pea" and "see". We love being outside and working with friends so we can help each other! Click on the images below to visit some websites with lots of interesting facts about dinosaurs.